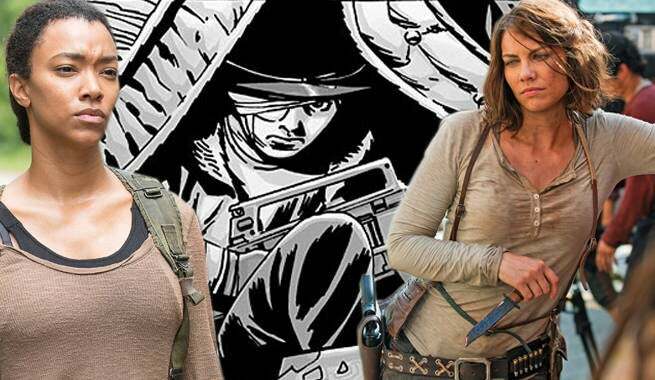 Spoilers for The Walking Dead Season 7 Episode 4 and all comics to date follow. Sunday night's episode of The Walking Dead may have felt a little slow, especially to those who don't have expectations based on the comics. However, by the end of the show's latest hour, several key and iconic moments from the comics were thoroughly staged. In the episode, Maggie and Sasha found themselves at the Hilltop community, marking their first appearance since the Season 7 premiere. Also around were Carl and Enid, who snuck out of Alexandria with their own motivations. Jesus and Gregory made their Season 7 debuts, as well, as the cowardice of Gregory prominently stood out above all else. On the following slides, we analyze a couple of moments which set the stage for several comic book story lines to be realized on television. Be warned, that means spoilers for The Walking Dead comics and potentially things to come on the TV series! It is extremely clear that Maggie will emerge as the leader of the Hilltop. In Go Getters, the character struggled with complications of her pregnancy but nothing could stop her from defending the Hilltop. Jesus and Sasha took on walkers but the horde was not going to stop if the music attracting them was not halted. Maggie ran over the car the Saviors sent into the Hilltop to break the speakers and silence it. All the while, Gregory hid safely in his room. 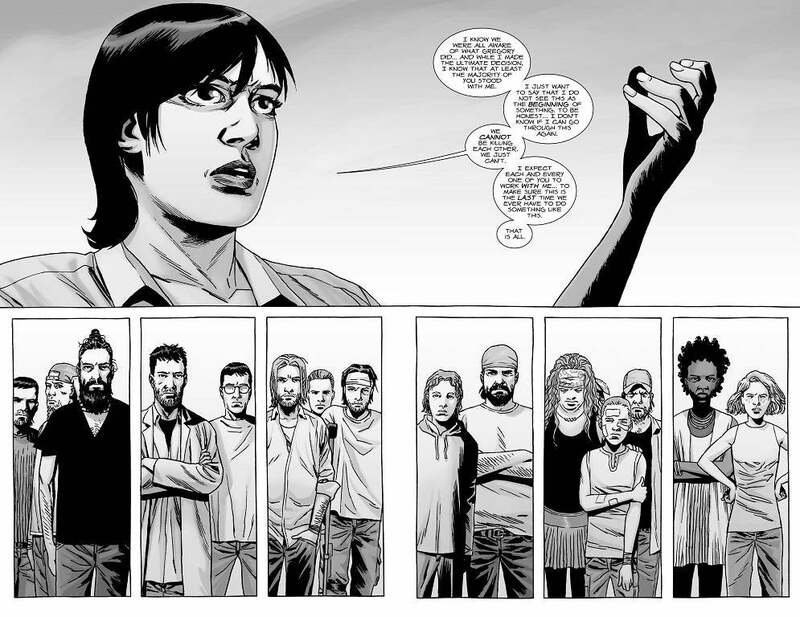 Jesus was the first to say it, others will surely follow, but the Hilltop is going to be looking to Maggie Rhee for leadership as she is the most experienced survivor currently living in their community. Though Enid is a character unique to the AMC series, she appears to be adopting the storyline of a major character from the comics: Sophia. Sophia was killed in the midseason finale of The Walking Dead's second season despite living on in the comics. 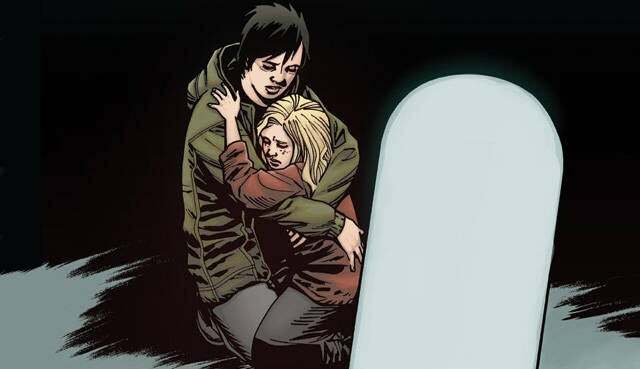 Through 160 issues, Carol's daughter lives on and has a very unique relationship with Carl. However, the more important relationship is between Sophia and Maggie. In the comics, Sophia's mother committed suicide. As we know, Carol is still alive on the show, so the roles have flipped between the two. In any case, without a mother, Sophia is adopted by Maggie in her early teenage years. Enid certainly appears to be filling Sophia's role from the comics, starting with dinner at the Rhee table. Like Enid, Sasha is unique to television. Also like Enid, Sasha is pulling from the storyline of a comic book character who is no longer around. In the comics, it was Holly who Abraham chose to leave Rosita for. Abraham's death different in the comics but it did come at a similar time. It was Abraham who got an arrow through the face rather than Denise, which prompted Holly's quest for revenge against the Saviors. Sasha is clearly feeling the same emotions Holly did in the comics. Following the loss of Abraham, she has nothing to lose. Her brother and ex-boyfriend have all perished over the past couple of years. The only thing on her mind is revenge and killing Negan. 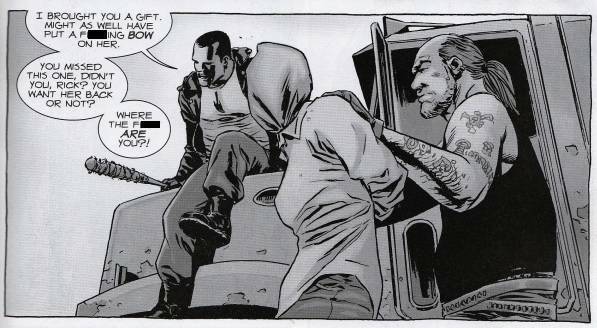 Here is how Holly's death went down in the comics: During a battle between the apocalyptic communites and the Saviors, Rick volunteers to drive a school bus through the walls of the Sanctuary so his army and walkers could make their way in. Holly refuses to allow Rick to take on something so dangerous, citing the man responsible for Abraham's death being inside as part of her motivation, and kicks him out of the bus. Holly proceeds to drive into the Sanctuary and never makes it back to Alexandria alive. When the truck full of guns and mattresses pulled off, no comic book fan could help but think that Carl was hidden in the back of it. However, this turned out not to be the case when Carl was seen in Go Getters, having stayed back at Alexandria. By the end of the episode, he had gone to the Hilltop with Enid and hopped into one of the Saviors' trucks with a course set for the Sanctuary. 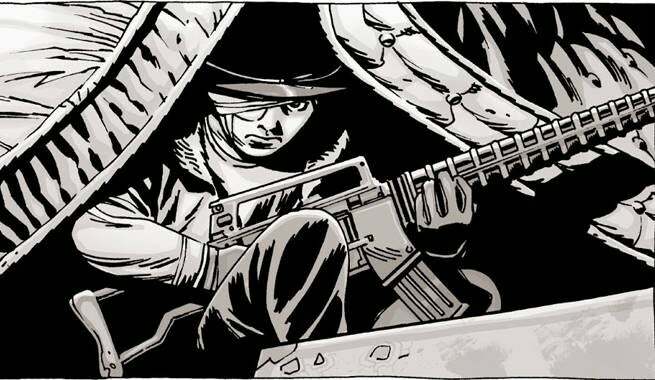 In the comics, Carl hitches a ride to Negan's Sanctuary by hiding in the back of one of his trucks. When they arrive, Carl uses a machine gun to open fire on the Saviors and manages to take out a few of them. He eventually runs out of ammo and is taken hostage by Negan. Hostage is a loose term, however. Negan has a twisted for of respect for the one-eyed bandit. He does do his duties in manipulating Carl and making sure he maintains power of Rick's only son but never hurts or violates Carl in any way during their time together. Still, Carl hates Negan more than anything and wants to see him dead. So much so that he eventually takes aim at him and winds up shooting Lucille. The defiance was already on display in Service. Seeing the Saviors tease Enid certainly did not help. The closing moments of Go Getters solidified the comic book storyline coming to life on television.